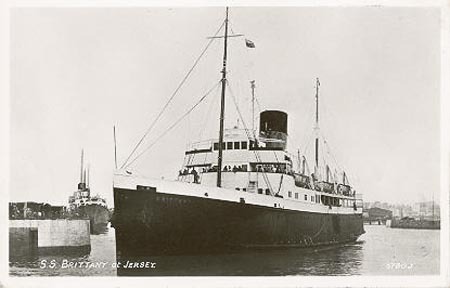 This page is devoted to postcards and photographs of the Southern Railways cross-channel ferry Brittany, built in 1933 by Denny (Dumbarton, River Clyde). 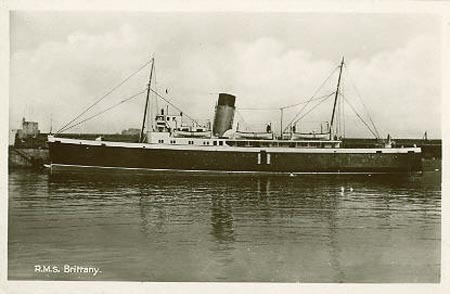 As built, she was 1522 gross tons and carried 845 passengers (62 in berths). 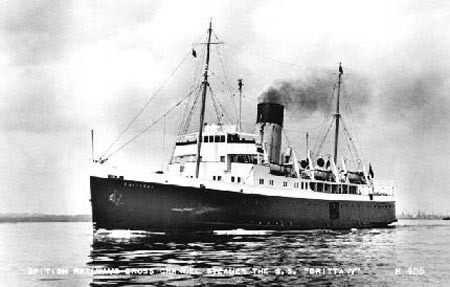 She was a passenger-only ferry until moving to the Baltic in 1963, although small numbers of cars would be crane-loaded, as on all cross-channel ferries. 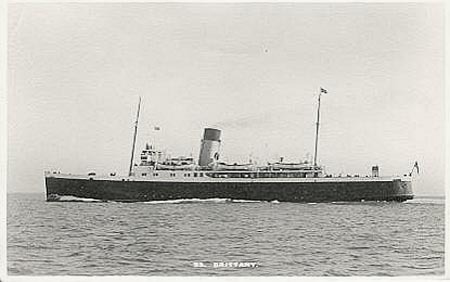 Brittany was specially built to operate year round services from the Channel Islands (Jersey and Guernsey) to various French ports (St Malo, Granville, Cherbourg etc). 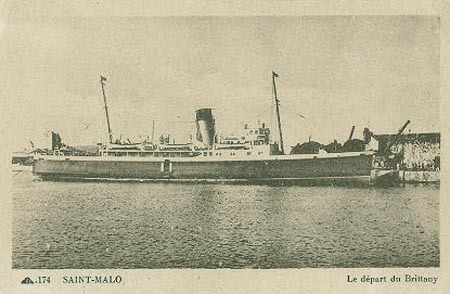 Her small size and shallow draft allow her to enter the extremely tidal port of St Malo at almost any time. 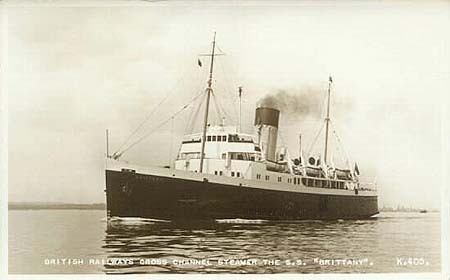 She rarely returned to her home port of Southampton in summer, but would regularly meet the Southern Railway cross-channel steamer Dinard at St Malo. 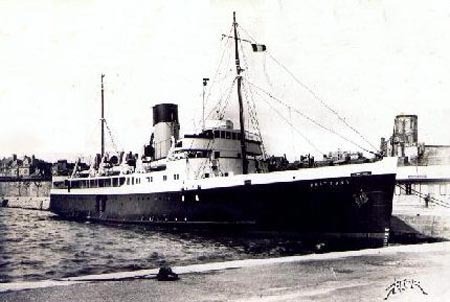 Brittany would later rejoin Dinard as part of Viking Line. At 1522 tons, Brittany was much smaller than other passenger ships in the Southern Railways fleet, and her turbines gave her a speed of only 16 knots. I have read that she was not much liked within the Southern Railways fleet, but this may be down to the fact that she was rather overshadowed compared to the larger and faster cross-channel ships. At the start of World War 2, Brittany helped with the evacuations from France. 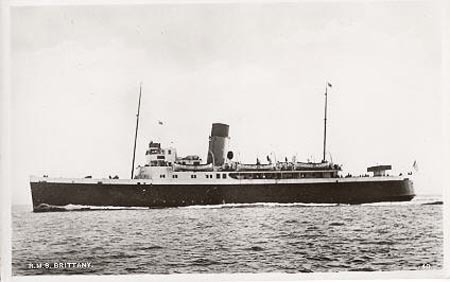 She was then taken over by the Royal Navy, and encircled the continent of Africa over 30 months between 1942-44, including a spell in Bombay, a remarkable feat for a ship designed for such short services. She returned to her old Southern Railway services in 1947, followed by transfer to British Railways in 1948. 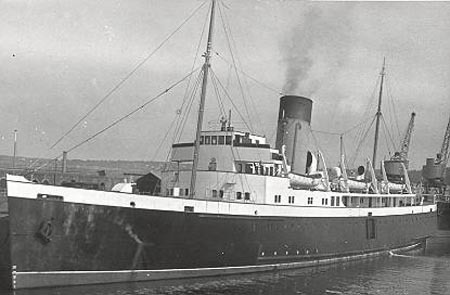 The winter services involved a single round trip each week from France to Jersey and Guernsey, after which she would return to Southampton. Although not advertised, these services often carried pasengers. 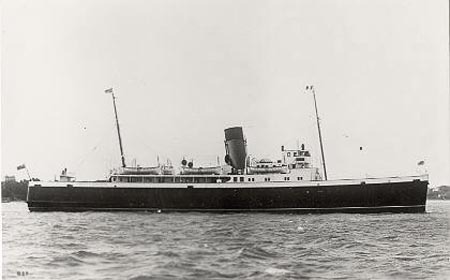 She was replaced by the Winchester (freighter carrying 12 passengers) during her winter overhauls. 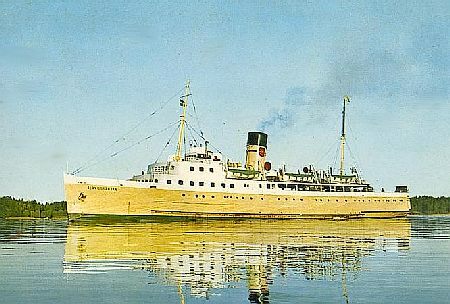 Brittany was withdrawn by British Railways at the end of 1962, and was sold the following year to Gunnar Eklund, who had formed Ålandsfärjan after disagreements with his Viking Line partners. 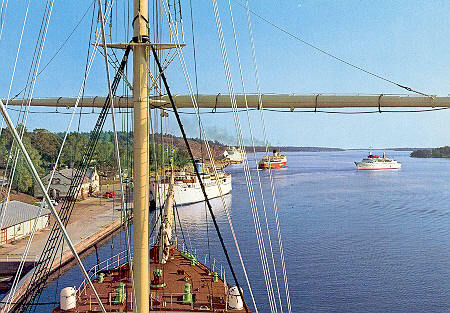 She operated as the Ålandsfärjan between Mariehamn and Gräddö (later Kapellskär), having been converted to carry cars. 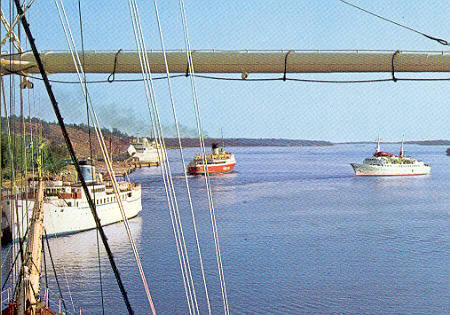 Ålandsfärjan later became SF Line, and rejoined the Viking Line consortium in 1967. 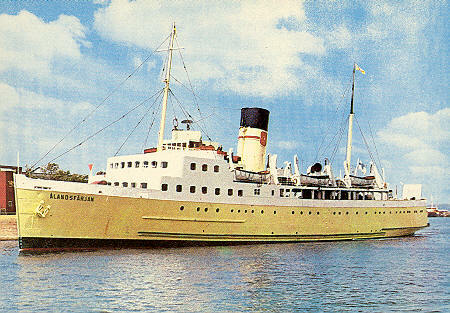 Ålandsfärjan was finally withdrawn in 1972, following replacement by more modern tonnage. The name Ålandsfärjan was re-used in 1987, when another English Channel ship was acquired by Viking Line. Skyphotos (serial 9236) postcard of Brittany. BB (London - serial 40) postcard of Brittany. RA Postcards (London - serial 6780J) postcard of Brittany at Jersey. An delightful M.Guerin (St Malo) postcard of Brittany in the locks at St Malo. An Editions Flor postcard of Brittany at St Malo. An unidentified postcard of Brittany. Cie. Des Arts Photomechaniques (Paris) postcard of Brittany at St Malo. Real Photographs photographic postcard serial 837 of Brittany. An A.Duncan photographic postcard of Brittany. 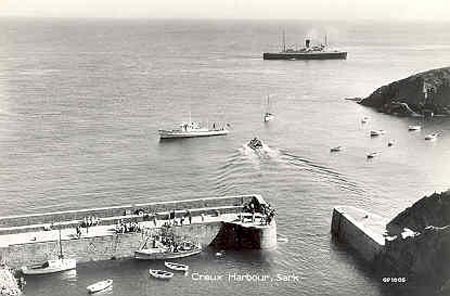 A Guernsey Press photographic postcard of Brittany off Creux harbour, Sark. Brittany was withdrawn by British Railways at the end of 1962, and was sold the following year to Gunnar Eklund, who had formed Ålandsfärjan after disagreements with his Viking Line partners. She operated as the Ålandsfärjan between Mariehamn and Gräddö (later Kapellskär), having been converted to carry cars. 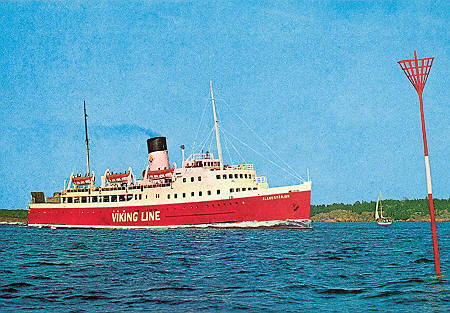 Ålandsfärjan later became SF Line, and rejoined the Viking Line consortium in 1967. 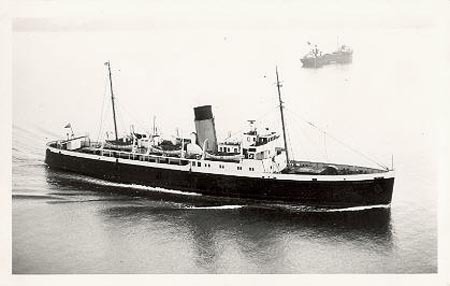 Ålandsfärjan was finally withdrawn in 1972, following replacement by more modern tonnage. 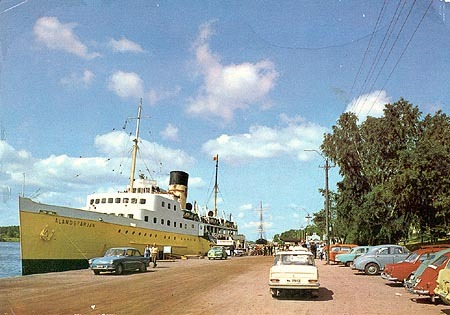 This is an official Ålandsfärjan postcard. Note the stern door for loading cars. 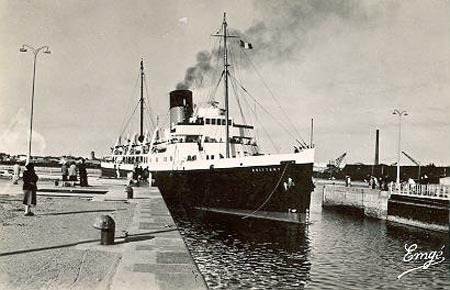 The Ålandsfärjan is shown at helsingborg immediately after rebuiling for Ålandsfärjan. 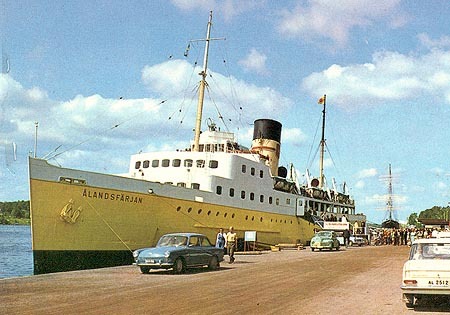 An official Ålandsfärjan postcard of Ålandsfärjan. Paletti postcard 2643/10 of Ålandsfärjan. Enlarged image from the Paletti postcard above of Ålandsfärjan. A general view of Mariehamn, with the red-hulled Ålandsfärjan visible leaving, plus an enlarged view.